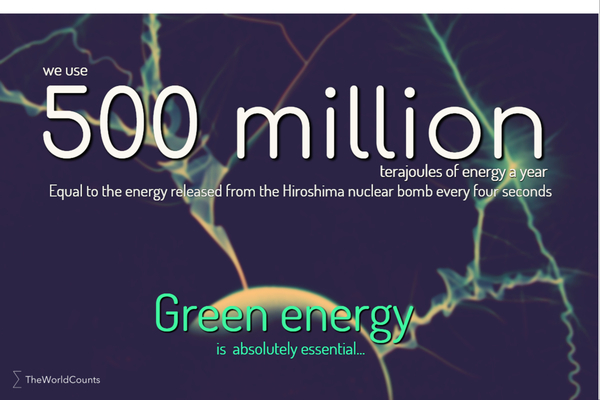 The world uses over 500 million terajoules of energy in one year. This corresponds to the energy released from the Hiroshima nuclear bomb every four seconds. A Boeing 737 can cross the Atlantic Ocean on one terajoule. 81 percent of the energy we use comes from burning oil, coal, and gas - also known as fossil fuels. Our use of energy will grow by about 35 percent between 2011 and 2035. If nothing changes, most of this increase will be covered by burning more coal. Main renewable energy sources include hydropower, bio-mass heating, solar power, and geothermal heating. A terajoule is a measure of energy. One terajoule equals 1 billion joules - a unit of energy named after English physicist James Prescott Joule, who developed the theory of conservation of energy and the first law of thermodynamics in the 19th century. In everyday terms, a joule is the amount of energy needed to lift an apple about one meter against the Earth's gravity. World energy use is 143.851 petawatt hours a year equivalent to. 517,863,600 terajoules (1 petawatt hour = 3 600 000 terajoules). Interested in more facts like the use of energy? Then plug in and subscribe to our newsletter.